The savory and sweet combination of fruit and meat together is satisfying; the fruit renders the meat lighter. Here Lidia uses prunes, but she often substitutes a favorite dried fruit, or fresh fruit in season. In the recipe, she suggests cooking the kebobs in a cast iron pan, but these will also do well on a medium hot grill. Start with the grill covered, then uncover for the last few minutes. In a large bowl, toss the pork, prunes, onions, and olive oil together. Season with salt. 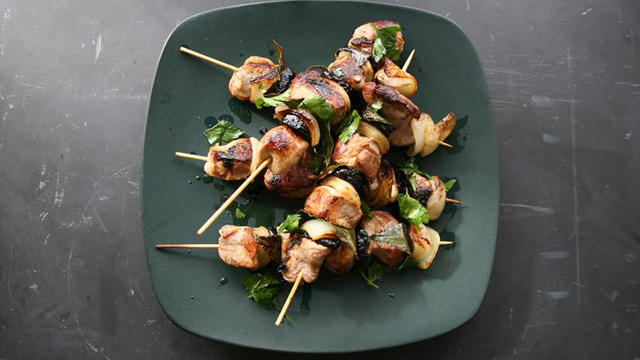 Thread the chunks of pork, prunes, onions, and bay leaves onto the skewers, alternating items. Heat a large cast iron pan or griddle (with cover) over medium heat. Sear the kabobs to brown the pork on all sides, about 5 minutes in all. Cover the pan, and reduce the heat to medium. Cook until the pork is cooked through but still juicy, about 15 minutes. Uncover, and let the pan juices reduce for a few minutes, turning the kabobs occasionally to glaze them with the juices. Serve immediately.